Many treasure hunters from around the world, explored many mysteries' nothing like the oak island treasure mystery, has ever code confused the most educated scholar's, over the many years. 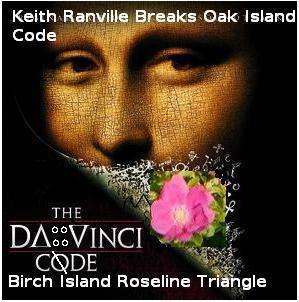 Until' I came along, Keith Ranville, cree code breaker; I had taken notice of the treasure mystery. I constructed a formula, using the best of native logic, something that has never been applied to this treasure mystery before. Most likely, because the treasure hunt was mainly run by caucasians. My native work, tore down oak island and re-mantled oak island in its proper order, most of everything was out of sync with the native readings of this treasure mystery. The symbols were ciphered and read improper, the oak island landscape was not taken into consideration, as a reading of the oak island mystery. Foremost, native spirituality gave a good insight to the treasure mystery. I spectacularly ceremoniously tossed up the shapes of these famous money pit symbols into thin air, like a role of the dice. Magically the oak island treasure code became apparent, the mystery unraveled before my eyes, in a logical message. Treasure direction; from the money pit stone read symbolically, to advance to the co-ordinance of a number of triangles. The treasure mystery, is not complicated at all, it was never intended to be confusing. Over the years, this treasure hunt was overindulged in digging to the point of irrational thinking. This curious power of suggestion thinking, led peoples captivating minds into the money pit, hypnotically, over the centuries. Sadly, needless of millions of dollars and 6 lives have been wasted in this curious pit' of distraction. Even now' as the truth about oak island sinks into the best of minds, a finale goodbye to the oak island mystery' is hard to grasp. As we adventure to the real treasure island quest, the birch island triangle, locale from the directions of the triangle money pit stone' clues.